A Hertfordshire community radio station has secured a broadcasting coup by relaying the first amateur radio call from the UK to a British astronaut on the space station. Pupils at Sandringham School in St Albans linked up live with Tim Peake as the International Space Station flew overhead this morning. They were able to ask questions - ranging from queries about liquid hydrogen and molecular forces to whether a helium balloon rises in space - and the live link was relayed by local community station Radio Verulam. A number UK schools are set to use amateur radio to link up with the ISS during the course of Tim's mission. 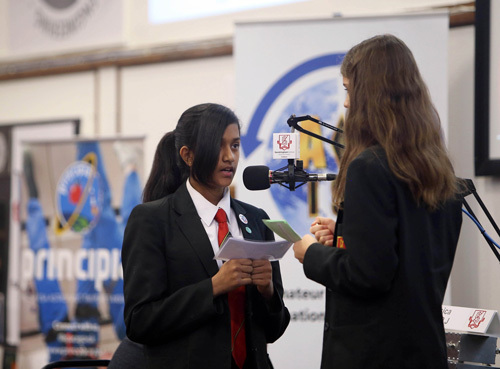 Sandringham pupils used amateur radio equipment and a tracking satellite dish to connect to the ISS and the call was led by a pupil who had recently passed her radio exams and is now a licensed amateur radio user. Today is World Radio Day, which celebrates the power of radio and aims to bring together broadcasters from around the world to share knowledge and reach out to new audiences. Last week Ofcom opened the doors of our Baldock Radio Station, to give budding engineers a rare glimpse of the goings-on at our spectrum management centre. Ofcom has today announced the award of two new community radio licences in England, serving communities in Manchester and Leicester. The number of UK subscriptions to television streaming services like Netflix has overtaken those to traditional pay television for the first time, marking a major shift in the UK’s viewing habits.